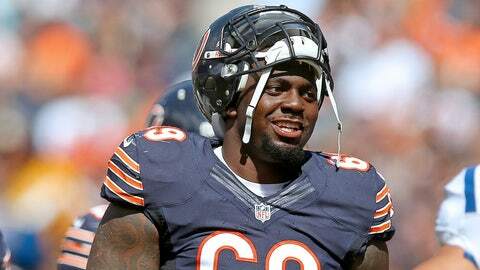 Henry Melton missed most of last season after tearing the anterior cruciate ligament in his left knee in September. The Dallas Cowboys have signed defensive tackle Henry Melton to an incentive-laden one-year contract with the free agent coming off a major knee injury. The deal signed Wednesday has a $1.25 million base salary and could be worth up to $5 million. The Cowboys hold a three-year option after the 2014 season. The 27-year-old Melton missed most of last season for Chicago after tearing the anterior cruciate ligament in his left knee against Pittsburgh on Sept. 22. Dallas is trying to rebuild its defensive line after franchise sacks leader DeMarcus Ware was released and 2013 leader Jason Hatcher signed with Washington. Melton has 15 sacks in 48 career games but will be needed more as a disruptive force in the middle. His best years came in 2011 and 2012, when he had 13 of his sacks and 50 of his 63 career tackles. Melton was a running back in high school in the Dallas area before becoming a defensive lineman with the Texas Longhorns. He was a fourth-round pick by the Bears in 2009 and missed his rookie season with an ankle injury. He will be reunited with former Chicago defensive coordinator Rod Marinelli, who now has the same title with Dallas after Monte Kiffin was reassigned after the Cowboys finished last in the NFL in total defense. "It’s like you’re betting on yourself," Melton said on the team’s website. "I feel like with me and my rehab and coming back with Rod and the good defense that’s here, I can get back to that form. I believe in that, and obviously they believe in me to get it done." Melton was arrested in December in Grapevine, where he went to high school, on charges of assault and public intoxication after police say he refused to leave a bar and fought with employees. Police say Melton was accused of punching the bar manager in the face and biting his arm. Melton’s agent, Jordan Woy, said at the time that his client didn’t start the altercation.